Weeding refers to the process of removing weeds from the garden. Defined as any undesired or unwanted plant the gardener does not cultivate, what one gardener calls a weed, another may cultivate for ornamental or culinary purposes. According to Jeff Schalau, an associate agent from the University of Arizona Cooperative Extension, weed scientists define weeds as plants that interfere with human activities. Weeds grow quickly and spread rapidly if allowed to complete the life cycle from seedling to forming seeds. In flowerbeds and gardens, weeds choke out nutrients and moisture, inhibiting the growth of the desired plants. In some case, weeds grow profusely, overshadowing the cultivated plants and depriving them of needed sunlight. Overgrown vegetation decreases air circulation and invites disease organisms. Weeding removes invasive or undesired plants from the garden or yard and prevents them from flowering, developing seeds and ultimately from reproducing. It improves the appearance of the landscape or garden, allows more room for desired plants to grow and prevents weeds from robbing the soil of nutrients and moisture needed for the cultivated plants to grow. Gardens that are weeded regularly are better able to resist disease. 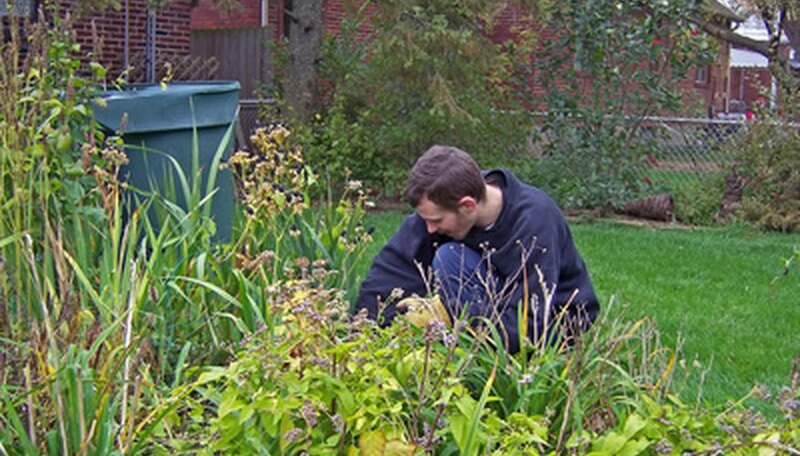 In home gardens or flowerbeds, weeds are typically picked by hand. Young weeds are often pulled up by the roots and discarded in an area away from the garden. Larger weeds may require the use of garden tools to remove. Skillful gardeners sever weeds at the soil level with a sharp hoe. Regular weeding, performed as soon as weeds emerge from the soil, prevents them from developing large root systems and keeps the soil free of invading plants. The North Carolina State University Extension recommends pulling weeds before they are 3 inches high. Weeding immediately after rains when the soil is damp and soft makes weeding easier, but walking on damp soil does cause it to compact. After-rain weeding of raised beds or borders keeps weeds under control. Regular hoeing or cultivating the soil between rows keeps weeds at bay. Remove and discard any overturned weeds away from the garden. Weeds allowed to remain in the soil quickly take root and begin to grow. Mulching under plants provides a weed barrier and inhibits weed growth. Weeds that grow close to the base of the plant are best removed by cutting. Pulling these weeds often results in disturbing the roots of your plants and may dislodge them from the soil. Cultivating the soil too close to the roots of vegetables or flowers damages roots and causes stress to the plants.